not blurry and trembling gradations of grey! at the Virgin’s base cruelties, crudely here glossed. Oh! rueful we ’member dismemberment’s cost. when up came the dummy’s cut-head from the muck! for twice ’pon our head that brute-iron struck! a flickering glimpse of a Crown sad betrayed? A pox on you bulb-shining, lens-profiteers! with the colours of true life from whence now you veer. for forced will you be then to fair-paint the Scot! 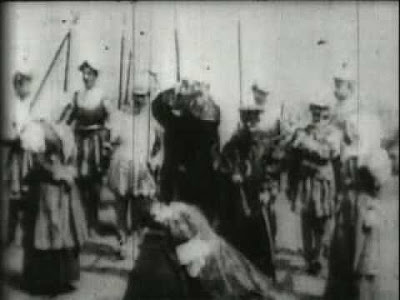 The Execution of Mary, Queen of Scots is among the many brief, 19th century films found Disc One of Kino International’s must-have, four-disc set, Edison: The Invention of the Movies. The film is about 30 seconds long. A grainier version can be downloaded from YouTube. And for dessert, Wikipedia’s entry on Mary, Queen of Scots. I. Actually. Liked... that poem. Was this poem released at the time of the release of the film? And was it printed as a supposed review of the film? I want to reference it in a class I teach and want to make sure the source is. Ha! You're half-right. It is a supposed review, but it was written by me, and I'm not that old, thank god. I like to try out different poetic styles, and it's the best way (for me) to capture the flavour of these super-short, old films. I have several others on the site, which you can locate by the age of the film. I don't know if that's much use for your course, but if you'd like to discuss it further, just direct-Tweet me, or provide me with your email address.